Gov. Eric Greitens makes a public appearance in Jackson to discuss his new tax plan which he said would cut taxes for 97% of Missourians and lower government regulations. His appearance took place at Signature Packing & Paper on Jan. 29 and was just one of many stops on his tour across the state. Missouri Gov. Eric Greitens says he is revolving his gubernatorial agenda around the basis of “common sense.” Individuals in the higher education system, however, disagree. 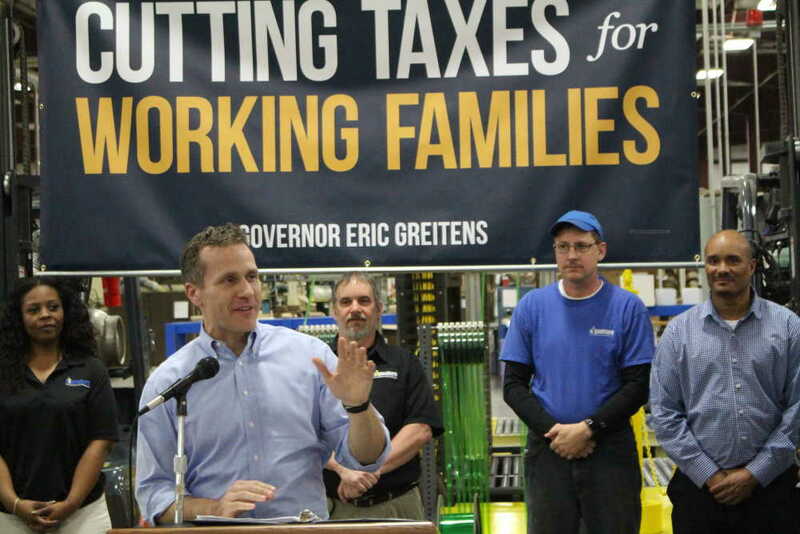 Greitens spoke at Signature Packing and Paper in Jackson at 4 p.m. on Monday at a public appearance to discuss his tax-relief plan he says will put working families first. He said, under the Greitens administration, Missouri has the lowest unemployment rate in 17 years, has accounted for every dollar in the Missouri budget and is working toward the reduction of 33,000 government regulations. He said his tax plan will cut taxes for 97 percent of Missouri taxpayers. Under the plan, taxes on Missouri businesses will be the second lowest in the country. During the annual State of the University address delivered Oct. 5, Southeast president Carlos Vargas focused the majority of his remarks on how Southeast is working to find $1.7 million to balance this year’s budget. Vargas also highlighted a slight increase to student retention rates and revealed Sonia Rucker would replace Deborah Below as dean of students. Since his first day as president, increasing student retention has been one of Vargas’ main goals. Vargas reported that freshman and sophomore retention has risen 1.1 percent, bringing retention to 75.1 percent overall. Vargas’ ultimate goal is to achieve 80 percent retention and and hopes that cutting the university studies 9 credit upper-level course requirement will assist in achieving that goal. Southeast’s Student Government Association Senate met Monday night to review the SGA budget and allocate organizations. The meeting also announced a “common hour conversation with the provost,” Wednesday, Sept. 20 to give students an opportunity to learn about and discuss the recent university department mergers, which affect students in eight departments. SGA president Peyton Mogley started the meeting by announcing that the hammocks have returned to the terraces on campus. Vice president Dylan Kennedy followed with announcements concerning the new campuswide tobacco-free policy. Kennedy said chewing tobacco, smoking and vaporizing are all prohibited, and students can file “incident reports” at the Department of Public Safety to report violations. Mogley said nearly 700 people responded to the survey SGA put forth to the student body of more than 11,000 in September 2016. The survey was open for two days to the entire campus community, and the policy changes came as a result of 63 percent of respondents who indicated favor for a tobacco-free policy. 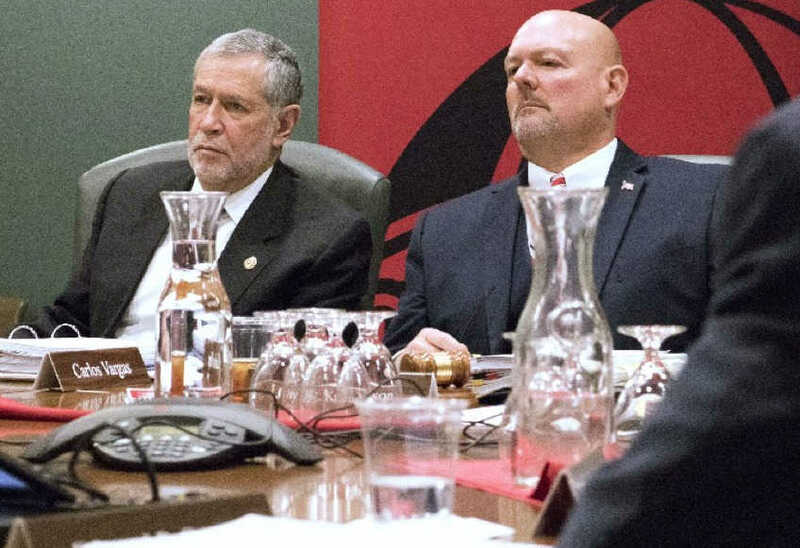 After months of planning, video-conferencing and interviewing, the nationwide search for a new associate provost of extended campus at Southeast Missouri State University has been called off due to recent budgetary cuts. Provost Dr. Karl Kunkel said the decision to cut the position was necessary. After Kunkel became the provost in February 2016, he said the news of the retirement of Dr. Gerald McDougall, late dean of the Harrison College of Business, and Dr. Allen Gathman, dean of Online Learning, came fairly quickly. In order to cover the responsibilities both men were leaving behind, Kunkel decided to reorganize the provost's office to include two associate provost positions. The positions would have been the associate provost for academic effectiveness and student success, for which Dr. Bethany Alden-Rivers has been hired, and the associate provost for extended campus. Kunkel said the work that would have fallen to the second associate provost will be absorbed by himself, the vice provost Dr. Charles D. McAllister, Alden-Rivers and other personnel as needed. On Jan. 22, Governor Eric Greitens laid out his ideal budget for FY19. The proposed budget, $28.8 billion in total, would cut $68 million from higher education for both two-year schools and universities. Greitens recommended Southeast receive $41,409,529, which would be a $4.6 million cut from appropriations in FY18. Recommendations for core funding set aside for Southeast is $4,140,953 based off the university’s achievements. While many cuts will be made to higher education, Greitens has increased the amount of funds to elementary and secondary education by $87.5 million. Recommendations were made for an increase to the A+ Schools Scholarship program from FY18 with $37,613,326 to $41,113,326 in FY19. Support of $1,000,000 for the Bright Flight Program also was recommended. Student Government Association Senate rounded out its Executive Committee this week with a new parliamentarian, shed light on restructuring policies and approved the budget for fiscal year 2018, but Executive Committee members said more efficient funding is still a priority for SGA and the university. Faculty Senate chairman and professor in the Department of Chemistry Jim McGill spoke to the SGA Senators in regard to recent university department restructuring proposals. He said the changes did follow university handbook policies, but the current policies pertaining to major academic restructuring were made during a financial crisis in 2000 and do not include opportunity for faculty members or students to voice their opinions. McGill said more department restructuring is likely to take place in the spring semester, some staff members will lose their jobs and students will be affected. He said it is a top priority to see that the handbook policy is rewritten to keep student and staff opinion from being overlooked again. McGill also made mention of President Donald Trump’s June 1 announcement that the U.S. will exit the Paris Climate Accord. He said Southeast intends to uphold principles of responsible stewardship for the environment and a new faculty organization for sustainability will be gearing up soon to usher conversation on the topic. Treasurer Luke LeGrand said an ad hoc committee has been formed to focus on auditing line item accounts like club sports, Student Activities Council, homecoming and WINGS shuttles. The Board of Regents at Southeast announced a 2.8 percent tuition and fee increase today effective this coming fall semester, according to a news release from Southeast. This will cause the price of courses to rise by $6.50 per credit hour for undergraduate Missouri resident students. According to the university website, tuition per credit hour for the 2016-2017 academic year was $199.30. All students will see a 2.8 percent increase, including regional campuses and online students, according to the news release. Non-resident undergraduate students' tuition per credit hour was $378.80 for the 2016-2017 academic year and will be raised to $424 starting in fall 2017 and online-only undergraduate tuition will increase to $272.25. Non-resident graduate students’ tuition per credit hour will be raised to $537.75 and online-only graduate students will see a raise of tuition to $334 per hour. Regional campuses will see an increase of $10 per credit hour, making each credit hour $170. According to the Southeast news release, this will bring in $1.34 million to the university helping to balance the FY18 budget; however, $4.05 million still has to be found in reductions to balance budget. A brown bag lunch and discussion was held on March 9 in the Academic Hall Auditorium by the Office of the President. This event was held in light of the $3.3 million budget cuts for the 2017 fiscal year and the possible $4.3 million cut if voted in by the Missouri House of Representatives and Senate for the 2018 fiscal year. Southeast student Grace Bastien was one of the students who attended the meeting. "I am interested to see if they say anything about raising tuition," Bastien said. Bastien is a fashion merchandising major and said she had not heard anything about cuts in her department. Southeast President Carlos Vargas began the discussion with a short presentation of the budget cuts and a few options to lower the blow on cuts. Vargas told the group nothing has been decided. These options included an increase in tuition at three different levels and/or creating an increase in the insurance premiums for faculty and staff. He also mentioned holding off on hiring new faculty and staff hiring for four months. Vargas went on to explain that all ideas would be presented at the Board of Regents meeting in April to be voted upon. According to the presentation, the state will withhold $3.4 million, around 6.4 percent of Southeast's current budget, for the 2017 fiscal year. Vargas said a delay in hiring new faculty and staff by up to four months could save the university up to $700,000. With the second year of budget cuts from the state, Southeast is still waiting for Gov. Eric Greitens to appoint a student regent. The student-regent position on the Board of Regents has been vacant since Jan. 2017. Bradley Jones was the last student regent on the board and was appointed by former Missouri Governor Jay Nixon. Jones only sat in on one board meeting because he was appointed during a congressional recess. His appointment was not approved within the 30-day timespan when state legislatures reconvened, and Greitens pulled his appointment as a way to preserve Jones’ ability to serve on the board in the future. When asked about his plans to appoint a student regent during his recent visit to Jackson at Signature Packing & Paper on Jan. 29 Greitens said he was not for sure on the appointment at the time but would make sure to follow up. In following up with Greitens’ office, the question of when a student regent will be appointed still remains. “There are currently over 1,300 vacancies we’re trying to fill and the SEMO Board of Regents is on that list,” Any Lutz, deputy press secretary in the governor’s office, said in an email. In the wake of the current budget cuts Southeast is facing, regional campuses are starting to be affected. In just the past week, Southeast announced that it’s Malden campus will no longer be offering classes after the Spring semester of 2018. Southeast President Carlos Vargas said many routes were explored to keep classes offered at the Malden campus. The president of Three Rivers College also collaborated with Vargas because the junior college also was planning on stopping classes after the semester. Due to the budget cuts set by Gov. Eric Greitens and the steady decreasing enrollment at the Malden campus, something had to give. “Unfortunately, this is something that is painful for people, I recognize that, I feel very bad about that, but we are in a situation right now where we just have very little choice,” Vargas said. The Malden facilities will stay open and be used for various events and meetings. Some of the current staff will stay on while others merge with other regional campuses and others cut completely. Nicholas Thiele, director of the Malden campus, wants to make sure students transition well during this period. 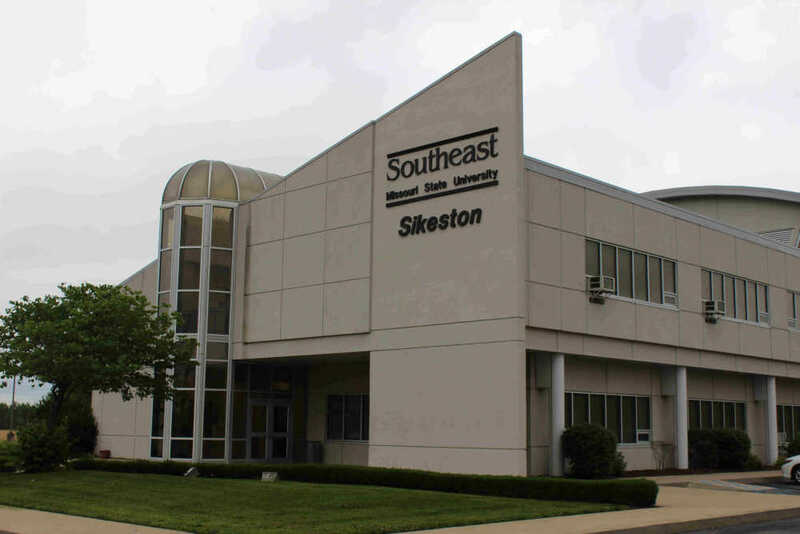 In another cost-cutting move, it was announced Jan. 30 the Southeast Sikeston campus will close its Child Development Center on June 29.All staff will be cut and will be paid through the end of June. After making numerous budget reductions over the past year, University president Carlos Vargas announced another round of cuts to current positions at Southeast. These cuts, announced Jan. 9, will finish balancing the 2018 fiscal year budget and cover the 2019 fiscal year. The reductions will impact by cutting 20 to 25 current filled staff positions and 15 to 20 vacant staff positions. This represents 4 percent of the university’s full-time workforce. Employees affected by this action will be notified in two periods. The first period will be from Jan. 20 to Feb. 2. A second round of notifications will take place in late April or early May, Vargas said. In an attempt to maintain quality and depth of education, no filled faculty positions are being eliminated, Vargas said. “We have been working on this for many months with the departments, individual units, supervisors and have done an analysis over every division,” Vargas said. All affected employees will be given a five-month notice before termination of their last day of employment. Vargas said the Department of Southeast Human Resources will work with affected employees, coordinating assistance with exit services, such as resume writing and practice interviews. The university even will give these employees a hand in exploring alternative employment options, if necessary. 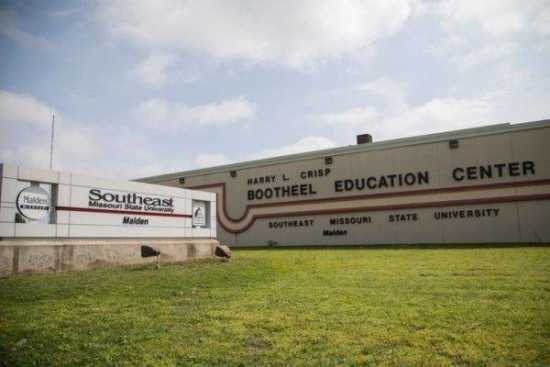 The Missouri Department of Higher Education has ordered Southeast to review low-completer programs at the university due to recent budget cuts. Known as an extraordinary program review, this request has been made statewide to all state universities and has resulted in the assessment of 22 different degree and certificate programs at Southeast. To be considered a low-completer program, an undergraduate program must be averaging less than 10 graduates per year over the past three years. Graduate programs are considered low-completer if averaging less than five graduates over the past five years. University Provost Dr. Karl Kunkel said the request is a call to look at the effectiveness and outcomes of the program to evaluate whether it’s a program worth having, despite the low number of students going through them. 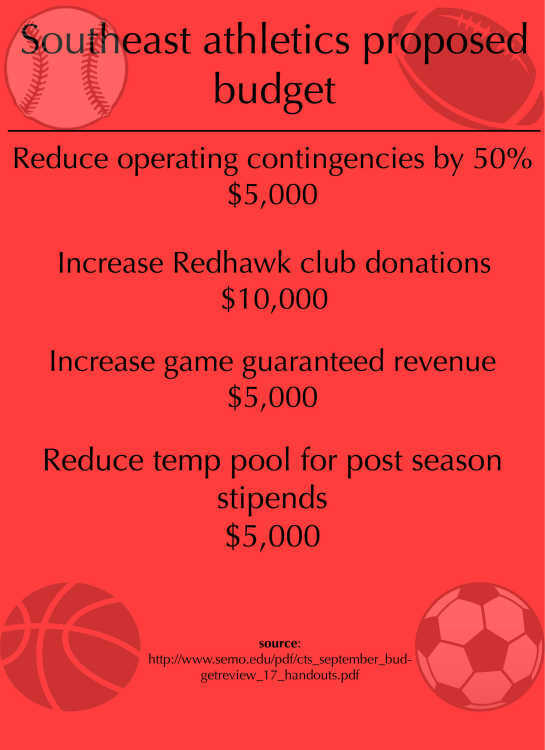 The recent budget cuts going on around Southeast has been affecting many programs, and the athletic department is no different. “Like everyone else on campus, we’ve been responsible for identifying budget reductions, revenue, enhancement opportunities to try and meet our part of the budget cuts up to this point,” director of athletics Brady Barke said. Barke added the magnitude of the cuts is still unknown until they know what the budget of FY19 will look like. “Fortunately for us, we’re in a situation where in addition to being able to identify ways to reduce expenditures, we also have some opportunities to try and generate additional revenues for us to try and offset some of those budget reductions so we can try and continue to do some of the things that we’re doing,” Barke said. At the moment, Barke said that they are doing as much administrative work as they can and look at how they operate outside of the individual sport. Editor's note: This story was updated for clarification on Three Rivers College name, location and closing. Also, clarification about Vargas' plans for future meetings with the advisory board in Malden. Citing declining enrollment, budget cuts and changing technology, Southeast announced Monday that they will no longer be offering classes at the Malden campus after the Spring 2018 semester. Three Rivers College also announced that they too will no longer be offering classes at their Malden facilities after the Spring 2018 semester. Southeast President Carlos Vargas said many routes were explored to keep classes offered. Since Three Rivers College leases a facility in Malden, Vargas met with its president, Wesley Payne, to discuss methods to try to jointly save both of their campuses. Vargas and Payne wanted to do their homework and make sure they were not leaving out any alternatives, so they even met with the mayor of Malden a few weeks ago to talk about the possibilities. After much talk on the matter, the decision was made to terminate classes offered at both the Southeast Malden campus and the Three Rivers College campus after the spring semester for both colleges. Southeast has taken steps to recover from budget cuts Missouri Gov. 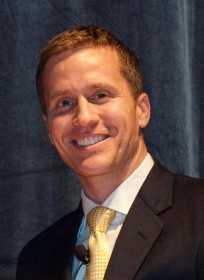 Eric Greitens announced in January. One step taken in August of this year was offering early retirement to some faculty and staff at Southeast. “It is an opportunity to reduce our personnel cost, but to do it through vacancy,” vice president for Finance and Administration at Southeast Kathy Mangels said during an interview in August. The program started Aug. 15 and ended Oct. 13, with 197 members of the staff and faculty able to apply. There were 78 members of the faculty and staff whose applications were accepted, Mangels said. The applications were reviewed and accepted by Southeast president Carlos Vargas, who has the final say over all applications, according to Mangels. KRCU, Cape Girardeau’s local National Public Radio station, may face hits to its funding if budget cuts proposed by the state and the federal government are passed. Located in the Serena Building at Southeast Missouri State University’s main campus, KRCU receives funding from the university, federal government, state government and public donations. Last week, President Donald Trump released his proposed budget, which allows for cuts to a number of government agencies like the Environmental Protection Agency and Department of Labor. The plan also proposes to “eliminate or zero out” other programs, including the National Endowment to the Arts and the Corporation for Public Broadcasting, the agency that issues grants to organizations like NPR and the Public Broadcasting Station. The CPB receives approximately $149 million per year from the federal government, 95 percent of which goes to nearly 1,500 locally owned stations around the country, many of which are in rural areas where little other broadcast options are available. Of the 575 stations receiving grants from the CPB, 162 of them are classified as rural radio stations like KRCU. These stations are made available in areas where other local media is scarce or nonexistent. Graphic by Katelyn Mary Skaggs ~ News Editor. Due to recent budget cuts, Southeast’s provost Karl Kunkel has been tasked with reorganizing the academic affairs division of the university and has proposed the restructuring of five different academic departments. The Department of Modern Languages, Anthropology and Geography; the Department of History; the Department of Communication Studies; the Department of Criminal Justice and the Department of Social Work are all affected within the proposals. Kunkel provided two proposals for restructuring. The first was to split apart the Department of Modern Languages, Anthropology and Geography to create two departments that are merged with the Department of History and the Department of Communications Studies. The two departments would be the Department of Modern Languages and Communications Studies and the Department of History, Anthropology and Geography. The second proposal was to combine the Department of Criminal Justice with the Department of Social Work. With rising expenses and declining enrollment, Southeast simply cannot go on with the five colleges that exist within the university now, according to the chief academic officer, Provost Karl Kunkel. 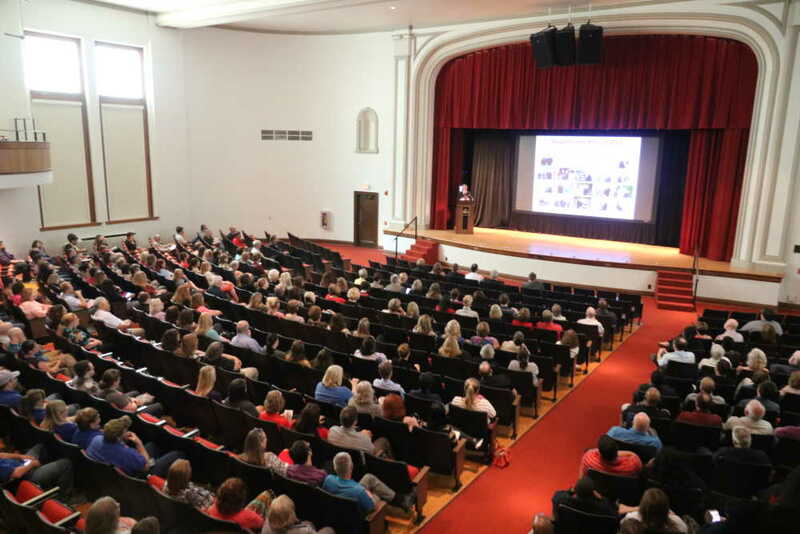 At a common hour presentation to faculty and staff at Academic Hall Oct. 25 Kunkel proposed three possible scenarios for restructure that would eliminate at least one college and multiple departments. The academic affairs sector of the university hopes to approve a restructuring proposal by May 18 to be implemented by July 1 for FY18, becoming operational for the 2018 fall semester, according to Kunkel. The academic affairs sector of the university needs to identify $1.2 million in department cost reductions — a fraction of the $6.1 million gap in the university budget. Kunkel said the proposed scenarios came from the university’s Council of Deans along with the executive staff. 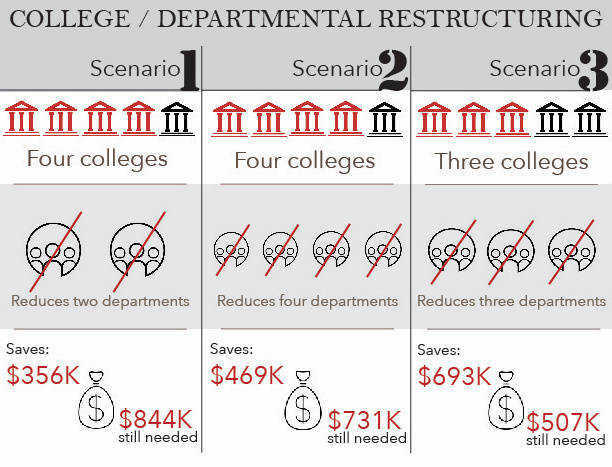 The three possible scenarios ranged wide in capital efficiencies and amount of change within the colleges and departments. The first scenario, which Kunkel called minimalistic, would merge the College of Education with the College of Health and Human Services. This scenario would save an estimated $350,000. 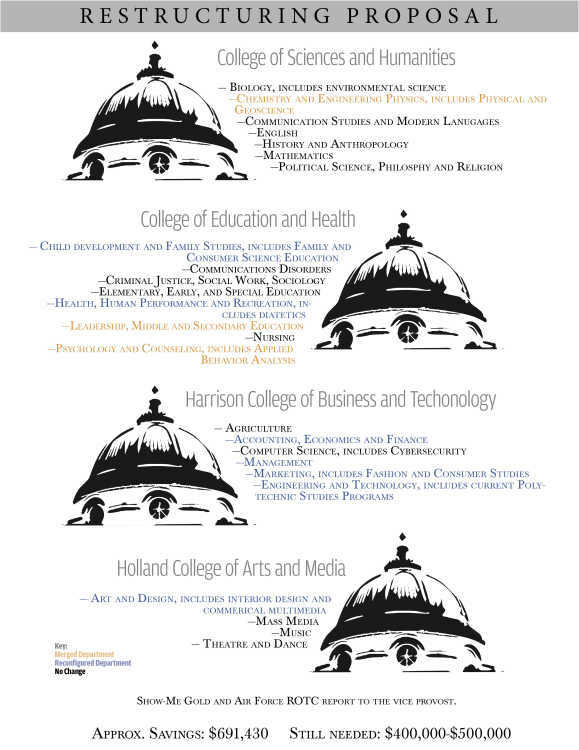 The second scenario would reduce one college and four departments and make the Holland school of Visual and Performing Arts an autonomous entity. The proposals were received by the departments on Aug. 23 and 24 and each has 15 days to respond to the proposed changes. The university is facing a $6.1 million reduction, 9 percent reduction from the state and a $1.8 million cost to continue. The cost for the university to contribute to the Missouri state employment retirement fund went up more than 2 percent, and there was also a 10 percent spike to health insurance premiums for university employees, which the school pays for. Provost Karl Kunkel submitted a major academic-restructuring proposal Friday afternoon to compensate for state budgets cuts made in July that reduced base funding for the academic affairs sector of the university by nearly $1.2 million. The restructuring proposal would reduce five colleges and one school into four colleges, eliminate six positions and two administrative stipends, and would reduce annual operating costs by $691,430. A single comprehensive proposal was submitted for consideration with several different college and departmental changes in order to give a broad idea of all changes needed to occur. Each department, Kunkel said, will have the opportunity to respond to their own piece of it to propose any alterations before being sent to the board of regents.